Chicken! 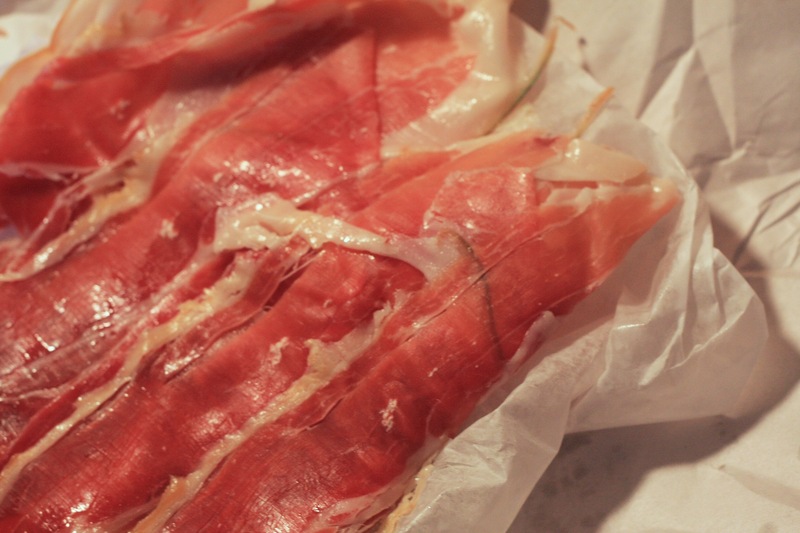 Prosciutto! Basil! Provolone! Together at last! On my barbecue! And now maybe on your barbecue too! 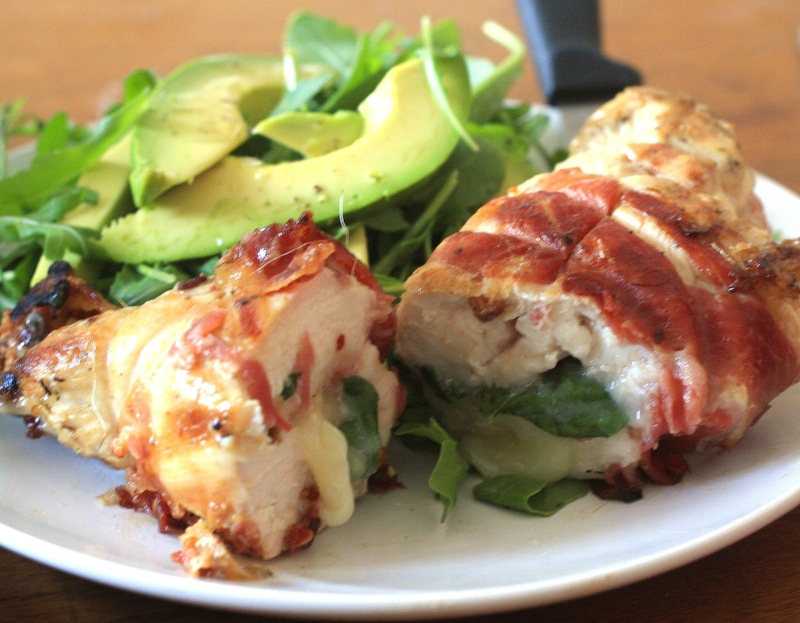 Do you want to learn how to butterfly a chicken breast from someone with a charming French-Canadian accent? Ok… here’s Ricardo. Lay the butterflied chicken breasts out so they’re ‘open’. 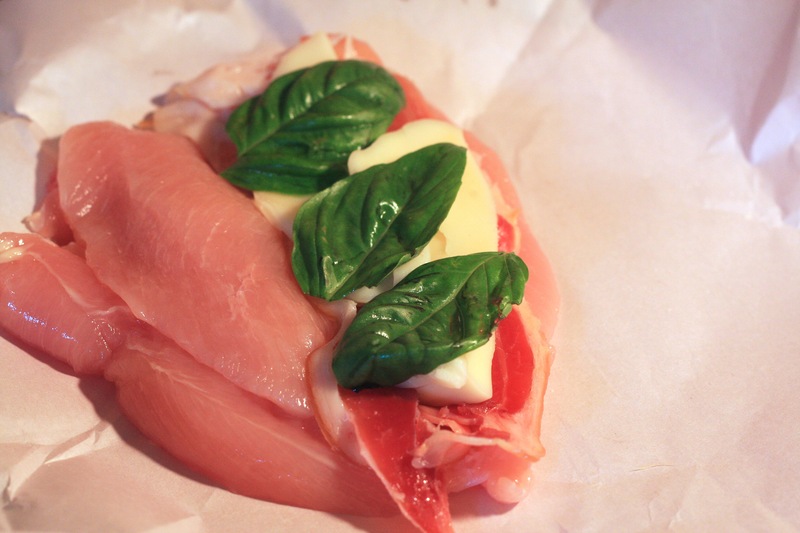 Place one slice of prosciutto, 3-4 basil leaves and half the provolone in each chicken breast and close them. 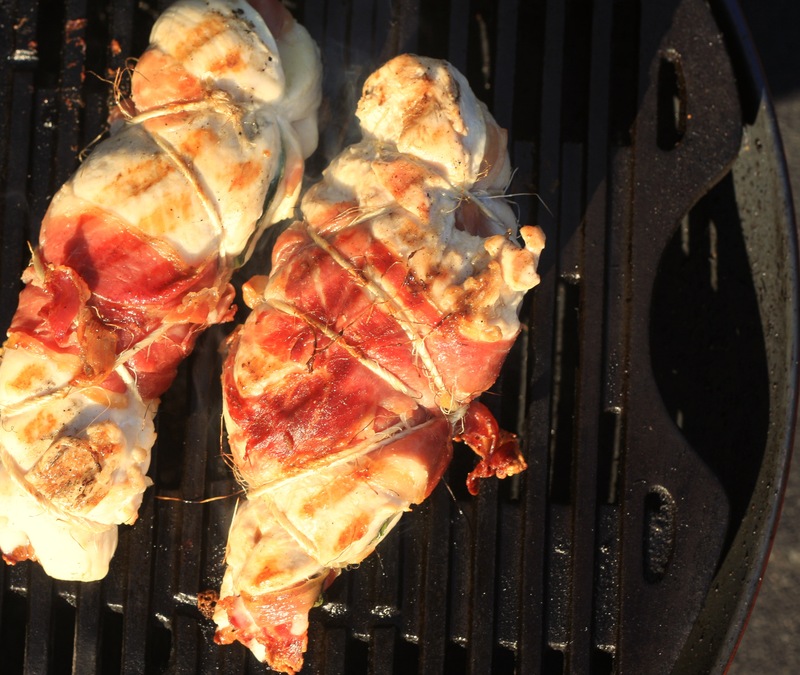 Wrap one slice of prosciutto around each breast, rub the outside with a bit of olive oil and tie with cooking twine. Heat the grill to high heat and cook the chicken until it’s seared on the outside and the juices run clear (cooking time will depend on the size of the chicken breast). Cut off the twine and serve. I live in a third story apartment above a shop in Chinatown / Kensington market. I do not have air-conditioning. This recent heat wave has left me sweating on my couch in my underwear thinking up devious plans to get into cool places. The best idea I had so far was to go visit my parents. Not that getting out of the heat was my only motive, I enjoy their company very much, but they DO have central air. It was the best. A by-product of visiting them is always wonderful meals. 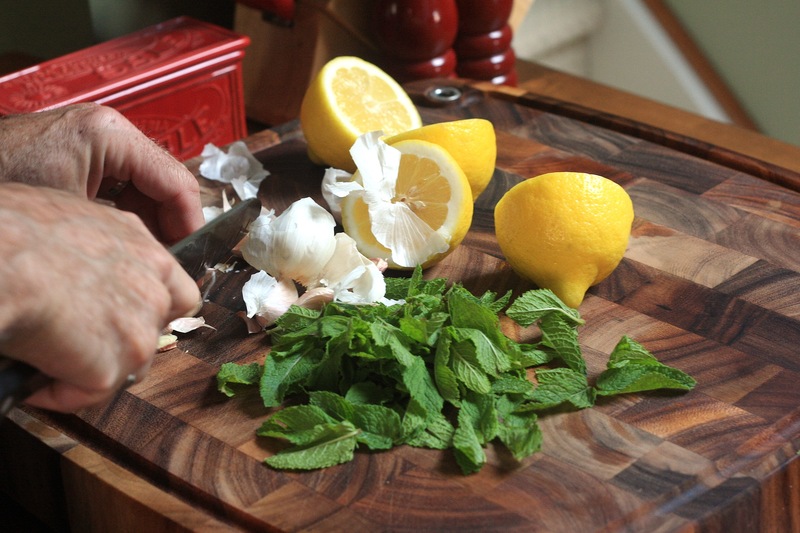 My dad is a great cook and a lot of my recipes are based on things he’s made for me in the past. 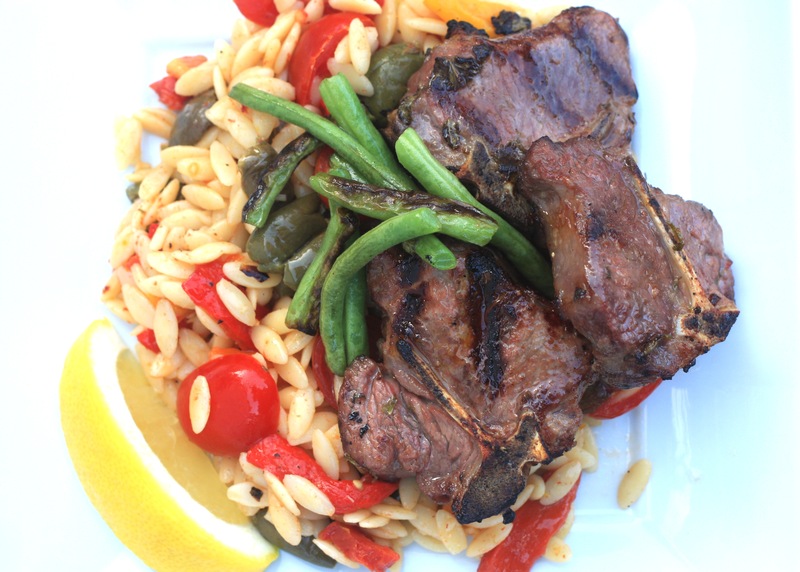 This weekend was lamb chops in a simple marinade along with an orzo salad full of cherry tomatoes, roasted red peppers and delicious caraffa olives. That was yesterday, today I’m back sweating in the hot heat. Tomorrow – water slides. 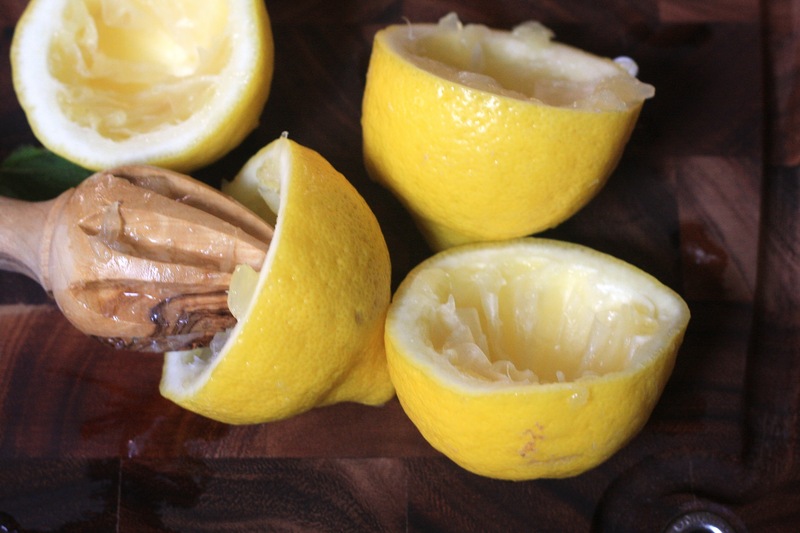 In a medium bowl juice the lemons, add mint, garlic and olive oil and whisk to combine. 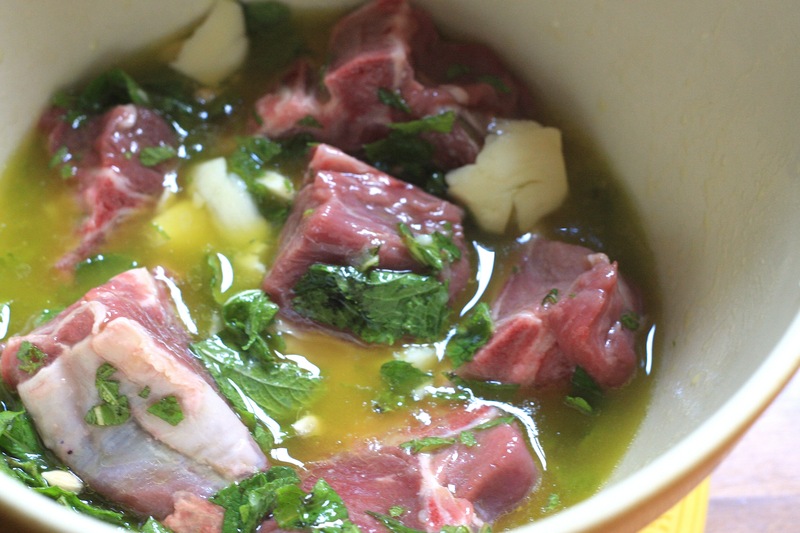 Toss the lamb chops in the marinade and refrigerate, covered, for at least an hour. Heat grill to high heat. Pat the meat with some paper towel to remove excess liquid and sear the lamb chops for about 5 minutes on each side. Happy birthday Canada. 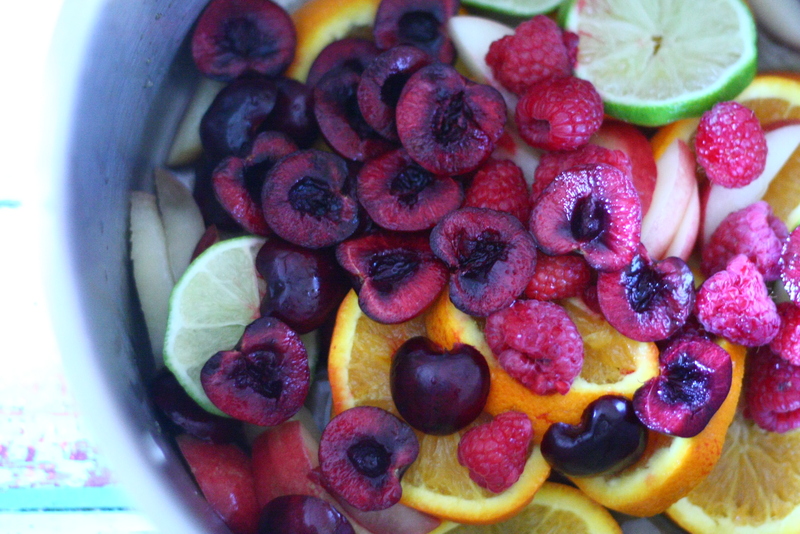 I made you sangria. A bucket of it. Just a little side note – you can use pretty cheap wine for this but don’t go for the bottom of the barrel, really bad wine makes really bad sangria. 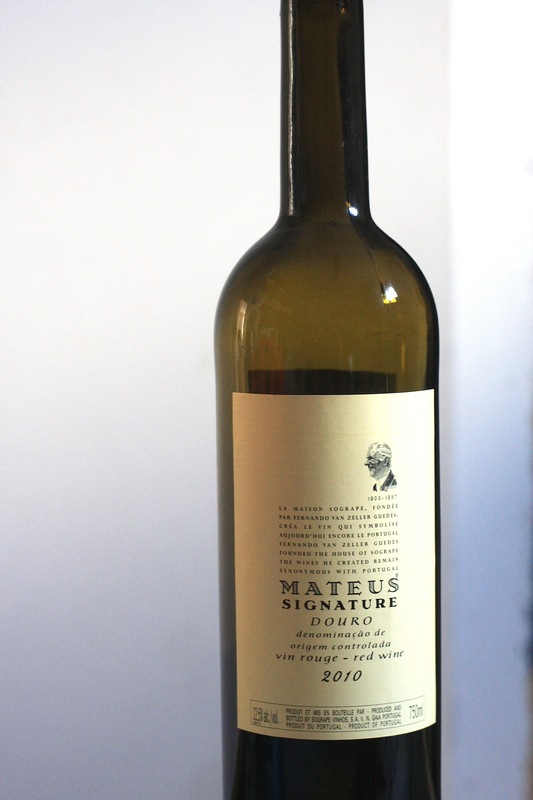 I use the Mateus (pictured below). It’s a perfectly drinkable Portugese wine and it’s only $8.95 at the LCBO. Throw the cherries, peaches and berries in your bucket (NOTE – I use a large soup pot, if you have an actual punch bowl and want to be all classy about it go ahead but any big bowl-y thing will do). Add the oranges and one of the limes, squeezing the slices as you add them to get some juice. Add wine, gin & Cointreau and muddle with the fruit a bit so some of the berries break down and you get a bit more juice out of the citrus fruits. 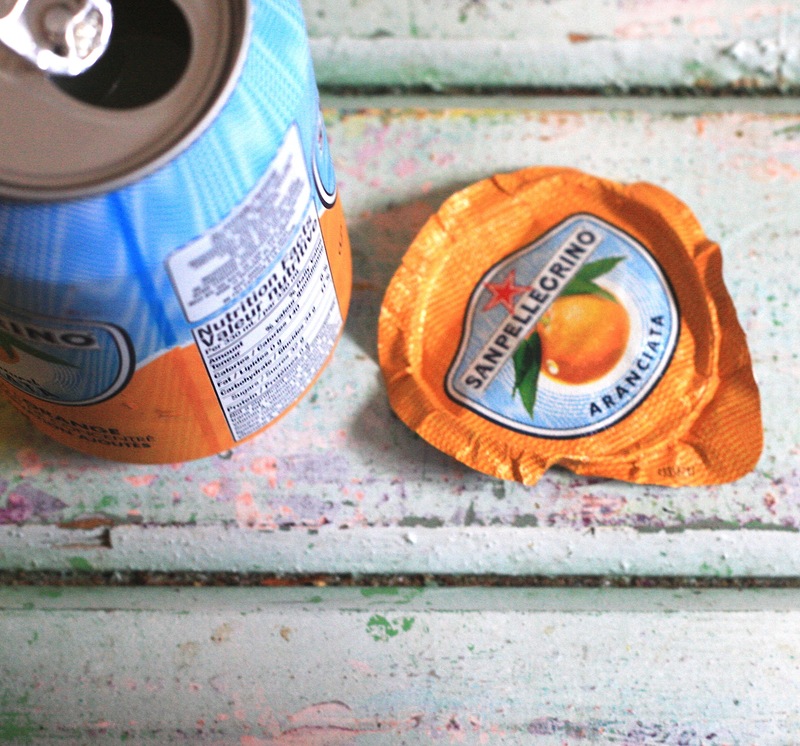 Add Aranciata and stir. 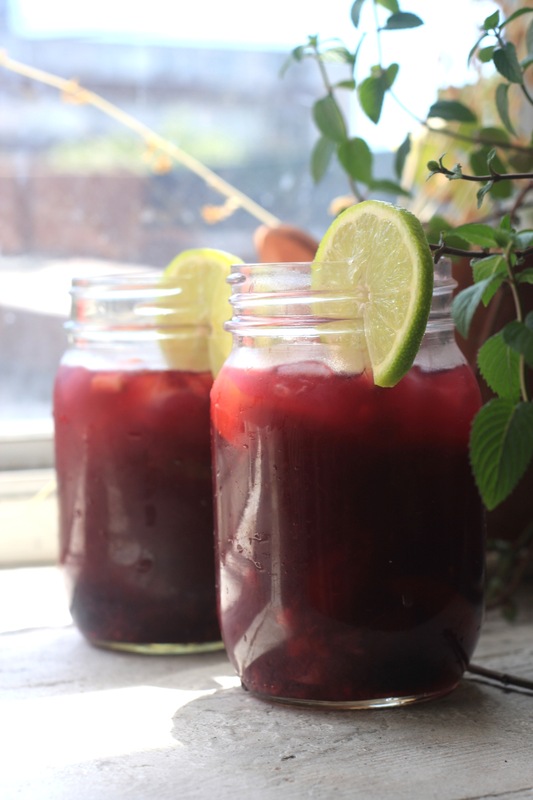 Taste the sangria, if you find it too strong (you pansy) add a bit of club soda to taste. Put a few ice cubes in a glass, scoop a bunch of fruit and sangria into that glass, garnish with remaining lime slices and drink it.